definitely Koze's remix it's an anthem trough the years. This delicious track was release on 2008 but if you listen now (2015) it's sound still fresh and nicely! Awesome! Koze's version is just sublime. Definitely a must hear. Dj koze version is a gem, probably not for dancefloor... It seems an early- "daptf-punkwithout machine" production.... Perfection could be Romanthony singin' "Basta ya de minimal". The trumpet is lovely! i love this track, for its grooves and funkyness and for its message. "basta ya de minimal!!" warm, alive, not dead and soul less like the standard issue "minimal". For a single entitled, _Minimal_, Matias Aguayo seems to have mock the idea of what's minimal indeed. Though his "Original Version" starts out with a stark, tribal-tinged rhythm and a few whistles here and there, once his vocals come in, chastising (bilingually), about music's problem with "no groove, no balls." 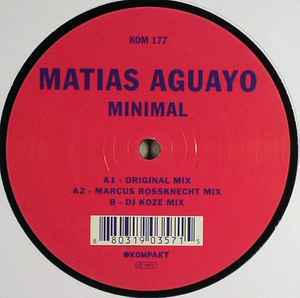 Marcus Rossknecht strips the original version of its extraneous bits for a cleaner sound, but DJ Koze here takes the cake with a disco-inflected version that somewhat demolishes the idea of "minimal" altogether in favor of a funky, full production. Here's a track that's got groove and balls.